Want to replace doing a coin toss and damaging your figures? This die is a D2! 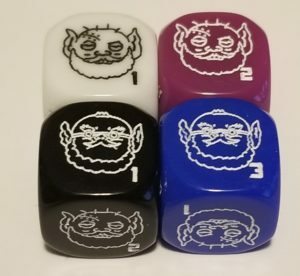 Tired of having to roll a D6 and divide to make a D3? This die is a D3! Want to just have something freakin’ awesome? Here it is! There are 3 different Emirp heads and 3 different Olik heads, all numbered 1-3. 4 colors of the design are shown for reference. 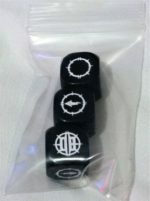 Each order is for 1 die.